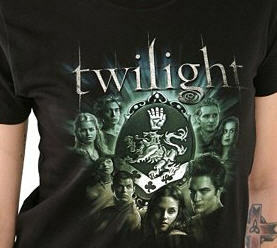 Hot Topic continues to add new Twilight shirts! It’s amazing, but they are by far leading the way with the most official Twilight movie merchandise. The Twilight Watching You T-Shirt is black with Bella and Edward in white. The lettering says “I just like watching over you” on the front and “Twilight” on the back. Hot Topic also has the first Twilight James shirt that I have seen. I don’t really like it, but if you are a fan of James for some reason, you might be interested in it. Be sure to check out Hot Topic each week for new Twilight merchandise. Yes! I’ll have to go to Hot Topic sometime and check out their Twilight stuff. 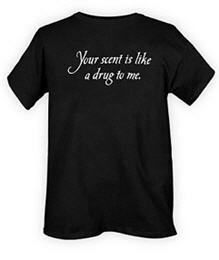 Hey love the “your scent is like a drug to me T- Shirt…Team Jacob all the way!!! I JUST LIKE WATCHING OVER YOU….. was that in the book? OMG……I LOV ETWILIGHT SO MUCH AND BY THE WAY GO GRIZZLIES YAY THATS RIGHT CREEKLAND GRIZZLIES……..! Twilight movie is so amazing I LOVED IT! ….. TWILIGHT IS THE BEST MOVIE EVER!!!!!!!! Hello this is just a random topic. No worries!